In 1914, a group of members of the Manila Club (which was then as now, the club for the British subjects of the community), formed the Nomad Sports Club. James Walker Cairns, a Scot born in 1870 was the first Nomads President from 1914 to 1934. The object was to foster British sports in the Philippine, in particular football, which was popular in those days. A league of strong teams, mostly Spanish, but including the Nomads, competed in Manila, and a combined representative side was the team to beat in Asia. 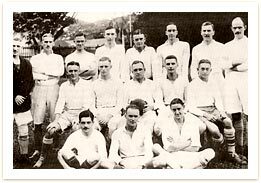 According to the FIFA Book of Record, “Manila Nomads” Football Team was the first Philippine Football Champion in 1914. The site chosen for the club was very near to the Manila Club on the corner of Marquins de Comillas and Padre Faura next to the Paco Cemetery. This site is now occupied by the Philippine President Line Building. The facilities were basic, and afterwards, refreshments taken at the Manila Club, where the Nomads had their own bar. World War II interrupted activities and those members unfortunate enough to be resident at the time were interned either in Santo Tomas or Los Baños Camps for the duration. The Manila Club was reduced to a shell during the liberation of Manila but soon after the end of the war, the Nomads were using its grounds for their renewed activities. Indeed, they were actively involved with the rebuilding of the Manila Club (now the Philippine Charity Sweepstakes Office) and the two clubs almost merged. The proposal to do so was very narrowly defeated at a general meeting of the Manila Club (mainly due, we understand to the fear of the dissenting members that well hit cricket balls would disturb and possibly injure bar patrons). Eventually, on January 14, 1949 The Nomad Sports Club was formed onto a Non-Profit Corporation under the laws of the Philippines with the purpose of establishing and maintaining a sports field and clubhouse and for the promotion of social, athletic and recreation activities of its members. A new ground and clubhouse were then constructed in 1949/50 in Makati, close to the corner of what is now Pasay Road and E. delos Santos Avenue. At the time, Makati was virtually an open grazing land on the brink of development by the Ayala Corporation. After an offer to sell the property to the club was declined by the Nomad’s Board of Directors in the 60’s, the club was forced to look for another location and moved to Merville in 1969. In 1977, two tennis courts were added to the club’s facilities. In 1981 as a joint project with the British School, a junior Olympic size swimming pool and changing rooms were completed. In 1988, the first and only lawn bowls green in the Philippines was inaugurated. Now after more than 94 years, Nomads Sports Club continues in the same spirit that has remained with the club throughout its existence that is to provide sporting facilities for anyone who cares to participate with the prime objective of having fun.